…the alarm of a fire was announced by the ringing of the church bell, or a watchman (perhaps equipped with a large rattle), calling out the warning through the nearby area to summon help. In those early days it was common for residents to keep two fire buckets available in case of fire. In fact, most municipalities passed a by-law to enforce the practice. Some towns even decreed that a ladder for roof and chimney access must also be kept handy. Responding to the alarm, neighbours would bring their own buckets to draw water from the nearest cistern or well to form a “bucket brigade.” The men would relay the full buckets while the women and children passed the empty buckets back to the water source to refill. Frantic efforts would be made to save furniture and belongings, and to attempt to prevent fire from spreading. As much building construction was of wood fire losses were severe. From the mid 1800’s to the present, massive changes have taken place in the fire service in Canada. Typically, after a by-law was passed by the local council to form a fire brigade, a selection process appointed senior officers, who in turn recruited interested, community minded citizens wanting to join the brigade. Brigades were often like clubs, offering prestige and stature to their members! 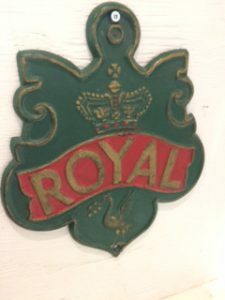 A “fire mark” of the Royal Insurance Company. Early municipal volunteer brigades, in some cases, had only a paid chief. Later, large departments went to full-time employment for all members. In many places more than one fire fighting service would be formed and this often led to competition — even battles — among them to determine which group would get to fight the fire and collect a reward from the insurance company which held the fire insurance policy for the building! Fire insurance companies provided their clients with metal plaques, called “fire marks,” which could be attached to the upper eave of an insured building. Firefighters could see this and know which company would pay them a reward for putting out a fire there. To complicate matters further, two types of fire companys often existed: “Hook & Ladder” companys and “Engine” companys. Brockville, ON, Hook & Ladder Company circa 1890. In early times, demolishing a structure was found to block the spread of fire to other nearby buildings and have a smothering effect on the fire. Hook & Ladder companys used ladders to access the upper storeys and roofs, and long pike poles with hooks to pull the building down! This let the bucket brigade to more easily get access to the actual flames. Engine companys were more concerned with putting water on the fire to douse the flames — “engine” always referred to the actual equipment used whether hand-drawn, horse-drawn or self-propelled. Even today, fire trucks are composed of two basic categories: ladder trucks, which mainly carry the ladders and tools; and pumper trucks, which are outfitted to carry and pump water (as well as carrying some tools and ladders). 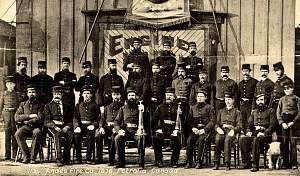 One of several fire brigades or clubs operating in Petrolia, ON circa 1876. As fire fighting companies continuously developed throughout the 19th and 20th centuries, likewise so did the equipment, often as a matter of necessity due to a particular fire catastrophe as per the example below. 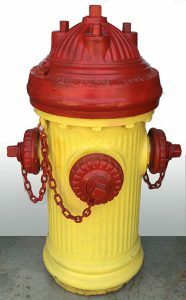 A high pressure fire hydrant introduced as part of the new system. This horrific blaze levelled 20 acres in downtown Toronto, causing 10,000,000 in damage (in 1904 dollars) and put 5,000 people out of work. Although firefighters tried hard to control the fire, the upper storeys of the taller downtown buildings could not be adequately reached by the water from the low pressure hydrant system then in use. The positive result of this fire was that the Toronto Fire Department’s firefighting capacity was greatly improved afterwards when a new high pressure system in the downtown core was installed which utilized powerful new, higher capacity pumps, a new water main system and special high pressure fire hydrants which were capable of supplying water to the upper storeys of the tall buildings which were becoming more prevalent. A view of the devastation caused by the Great Toronto Fire 1904.